Thos. Sonne Junr. a sub supplier of bar and rolled steel for metal working enterprises and a producer of special products for individual customers has felt the increased competition from Eastern Europe; a competition that can only be met by rationalisation and streamlining production. 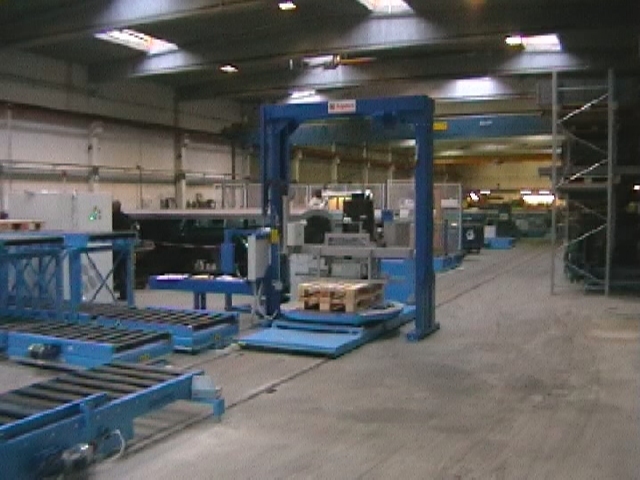 Therefore, Sonne has installed a new internal materials handling system developed and supplied by Q-System. The new plant has streamlined the flow of raw material to the power saws and eliminated transport of pallets by fork lift truck hereby releasing those employees for other jobs in the production. Additionally, the indoor environment has been significantly improved as the amount of dust in the air is considerably reduced now, that the use of truck has almost been eliminated. The inlet end of the new conveyor system is in the raw materials store. The raw materials store adjoins the workshop which has a number of power saws placed side by side. Placed between each power saw and the wall to the raw materials store there is now a trough-shaped roller conveyor. This conveyor adjoins through a hole in the wall two parallel “trough conveyors” in the raw materials store. 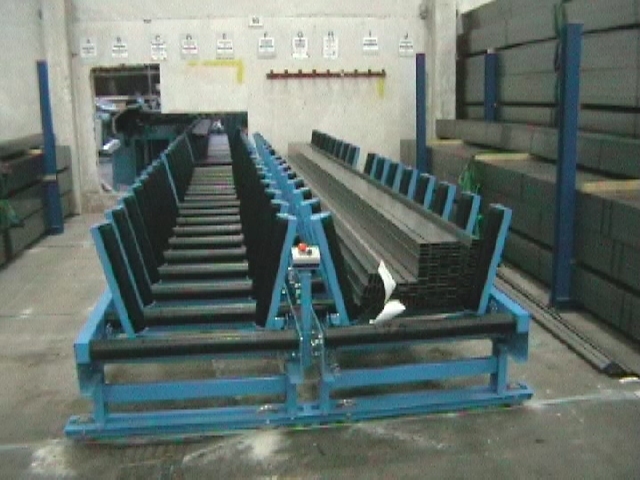 These two conveyors are connected and can be moved sideways as they run on rails. In the raw materials store the pipe bundles are placed on one of the two trough-shaped conveyors after which the power saw operator can call a pipe bundle to his machine. This is done by keying-in the number of the full conveyor on his operator panel, whereupon the control system will see to it that the conveyor is moved sideways and positioned opposite the roller conveyor leading to the power saw. The pipe bundles are automatically transported to the power saw and then lifted into the saw. 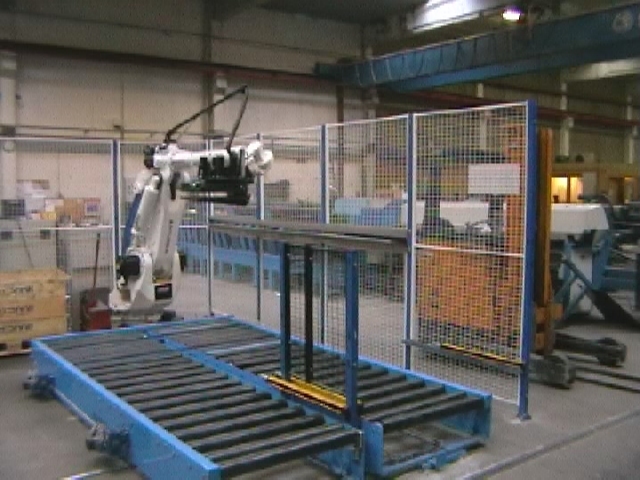 The cut items will fall into a container from where they are picked up individually by a robot supplied by Q-System and placed in a boxed pallet. The power saws are placed side by side. 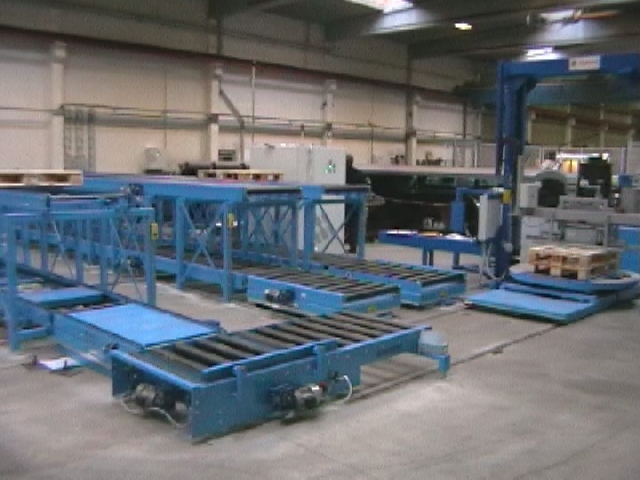 At each saw there are two conveyors, one for a full pallet and one for an empty pallet. Transverse to these conveyors there is a 63 m long drive way for a transfer cart which takes full pallets to the storage racks and empty pallets to the power saws. 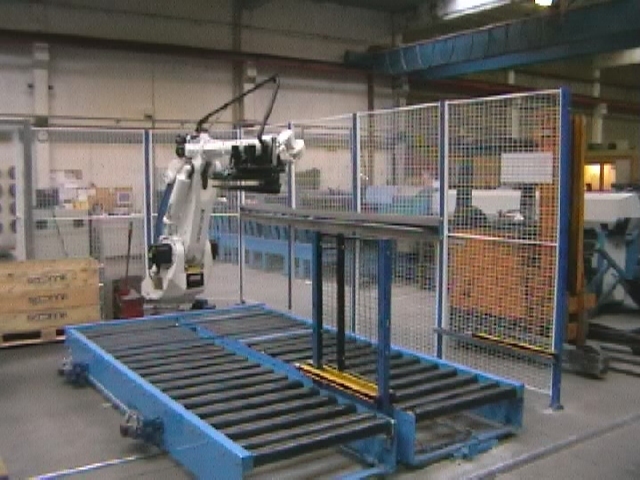 When the robot has filled up a pallet, a signal is automatically given to the transfer cart to deliver an empty pallet and pick up the full pallet. At the same time the full pallet will run to the end of the conveyor, now standing ready for transfer to the transfer cart. 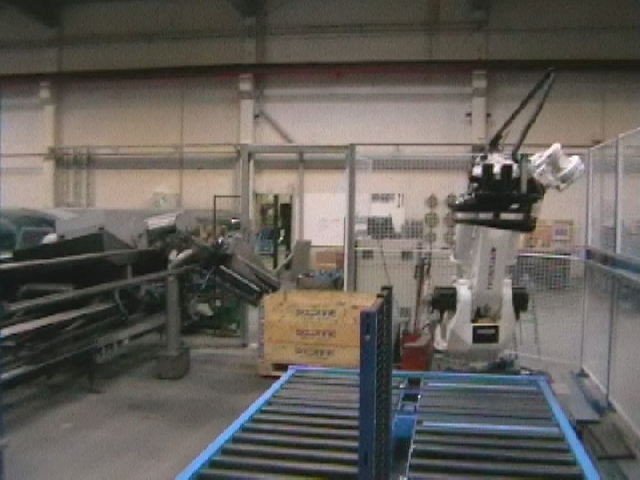 As soon as the full pallet has moved forward an empty pallet is angled from the parallel conveyor so that the robot can immediately start filling it. The transfer cart has its starting point at one end of the 63 m long drive way where two-level storage conveyors racks for empty and full pallets are placed. When the transfer cart has been asked to pick up a pallet it moves into the correct position at the storage rack whereupon an empty pallet is transferred to the cart. The cart drives to the power saw in question and transfers the empty pallet to the inlet conveyor. 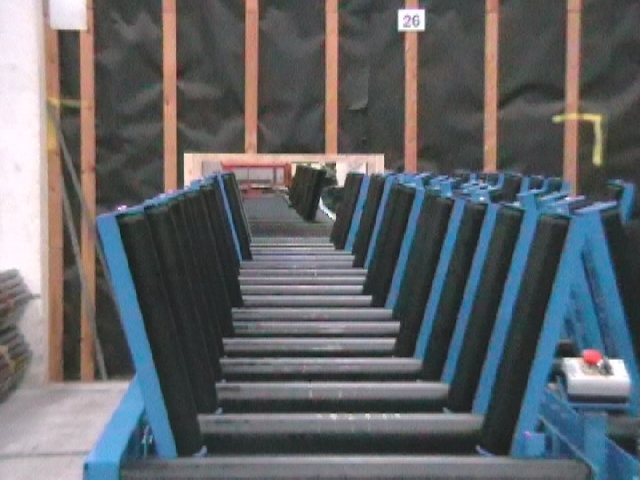 Afterwards it positions at the adjoining conveyor, and the full pallet is transferred to the cart. 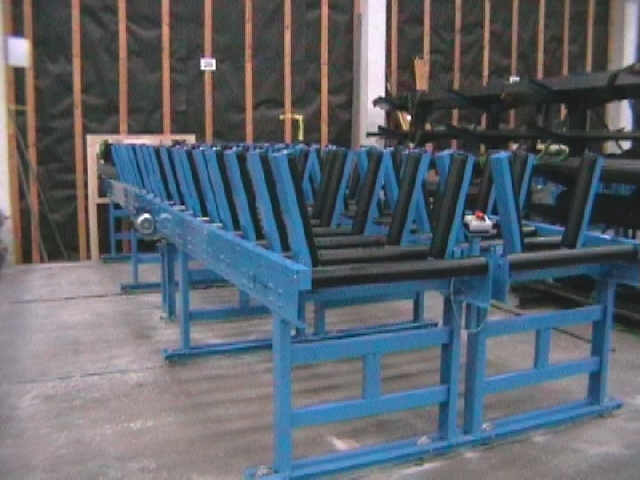 After a short stop in a strapping machine the transfer cart drives to the previously mentioned two-tier storage conveyor racks, the pallet is transferred to a lifting table, raised and fed into the rack. Now, the transfer cart is ready for the next pallet pick-up. The unique thing about the two-tier storage rack is that there is, though limited in size, enough space for the output of a day or a night shift. It works like this: at the end of a shift, the full pallets are removed from the storage racks and 3 of the four conveyors are filled up with empty pallets. The new shift will start with filling the empty conveyor with full pallets, and when the next conveyor is emptied of empty pallets, this conveyor will also be used for full pallets etcetera. Using this cycle each shift can start up with both a sufficient number of empty pallets for a one shift output and sufficient space for the full pallets. Apart from the advantages of a streamlined and much quicker materials handling with reduced manpower and an improved indoor environment Sonne Junr. have also noted that their reject rate has been reduced.